Recent chemical attacks in Syria are nothing but a staged provocation, as the opposition forces want to disrupt any negotiations and trigger foreign intervention, and western forces are part of it, Brian Becker, Director at Answer Coalition, told RT. RT:Syrian government forces apparently have the upper hand in the fighting - so why would they resort to chemical weapons? Brian Becker: The United States and Britain are trying to find some provocation, some pretext to escalate their own intervention in Syria. 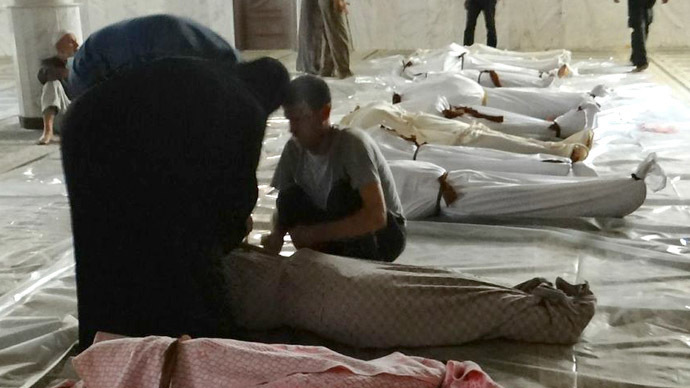 It is completely ludicrous that the Syrian government would use chemical weapons at the very moment when the UN is launching its investigation about the chemical weapons and since the Syrian government has its advantage. But none of that matters. What really matters is the intention of the White House and their friends in London in terms of escalating their intervention. I think we will see at the UN Security Council and in the days to come what their intentions really are. RT:Why won't the Syrian authorities allow the UN inspectors - who are already in the country - to visit the site? BB: I think the Assad government will want to do that, they will feel quite confident that unless the inspectors themselves are agents to foreign power trying to carry out the staged provocations and confirm it, they would prefer to have an objective group come in and say ‘yes, if there were chemical weapons they came from rebel held areas’ which some of the evidence points to. If the Syrian government feels that this inspection team is nothing more than an extension of the provocation, then of course the Assad government will have to take that into account. RT:The UN Security Council is holding an emergency meeting on events in Syria - will that help? BB: The Security Council in itself is not the venue in which the basic decisions will be taken about Syria because you have a Security Council that is polarized. You have Russia which is taking a position that there should not be a foreign intervention, there should not be a foreign fueled civil war going on in Syria. They are trying to restrain the western powers. At the same time in the US there is a debate, there is chorus of people who demand opposition and then there are those who are afraid that the unintended consequences of an intervention could be quite great. I think what will happen depends more on what happens in the Washington establishment in terms of its pre elections for an escalating intervention. I don’t think it will be the UN. RT:The US President said the use of chemical weapons in Syria would become a red line. How do you think the West will react to these allegations? BB: The red line is a false rhetorical construct. Obama created it; they can use it or pull back from it at their will. One thing we must be at [on] a look out for is whether the United States seeing the crisis in Egypt would like to change the subject and focus instead public attention on Syria. The United States is managing a very big crisis in the Middle East. It is holding on to the Egyptian military, it is funding the Egyptian military but in a very unsettled situation. Will the US try to gain the upper hand again in the Middle East by a military intervention? Up until now sectors of the Obama administration have been afraid of that but there are others who are demanding, arguing that the US should show its power and do so by intervening in Syria. That will be the big test in the coming days. The US government and the British government working in concert are not neutral observers or objective observers of the situation. They are the funders, those sending the military weapons to the armed forces in Syria fighting the Assad government and I believe they are working in cahoots or in concert with them to carry out staged provocations like these staged provocations designed to pinpoint or demonize the Assad government as using weapons of mass destruction. History will demonstrate, and I hope it will demonstrate soon, that it is just that, a staged provocation, but the British and the Americans are part of it. RT:If this is a staged provocation who’s also interested in it? BB: The big goal of those who carry out the staged provocations is to disrupt any negotiations that could lead to a positive outcome to the existing Syrian government meaning that the forces of the civil war had not succeeded in lagging the Assad government, which is their only goal. What they are trying to do is to draw in the Western powers and say to the Western powers ‘no negotiations, negotiations are not the way, there must be an escalated intervention’. No fly zone and that of course would mean the beginning of bombing of Syria. They know that without western intervention, without escalated foreign intervention there is no possible way that they will succeed on the Syrian battlefield. They don’t have the popular support and they don’t have the military wear to defeat the Syrian government. RT:Why have they not succeeded yet?